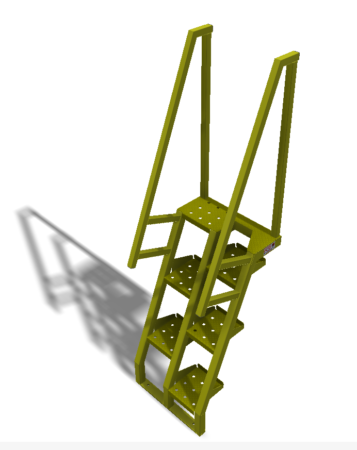 Alternating tread stairs allow for steep inclines without the inherent danger when using a conventional staircase design. 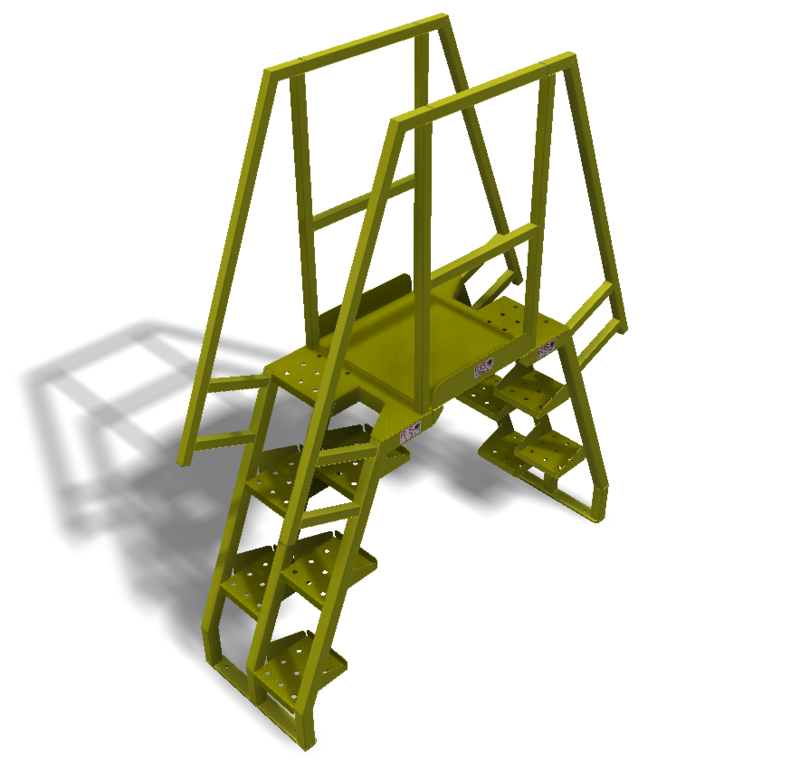 The angle of rise will cause some to call them alternating tread ladders. The stair tread is uniquely formed to easily plant all weight bearing parts of the foot without the obstruction of the half of the tread not being used at that level. What it facilitates is easy and surefooted movement going up or down the staircase. Normally a design that gives so much advantage in one area will take away in another. Not so with the Brazos alternating tread stairs. This safe and natural climbing motion can be compressed to an incredible vertical climbing angle. It does so using very little lateral space. This may open up access to other levels from areas previously not possible. Design of the individual stair treads is the start of the safety and function combo that is a hallmark of all Brazos Manufacturing products. The flange up design on three sides of each tread along with the perforated (pierced) metal ensures the foot stays on the tread. As the operator takes a step the line the foot travels is direct to the next step for that foot…not having to negotiate over the tread for the alternating foot. The third stringer makes for an incredibly strong design. No flexing or movement gives that sure feel and allows for positive and natural ascending and descending the staircase. Handrails complete the positive user experience. 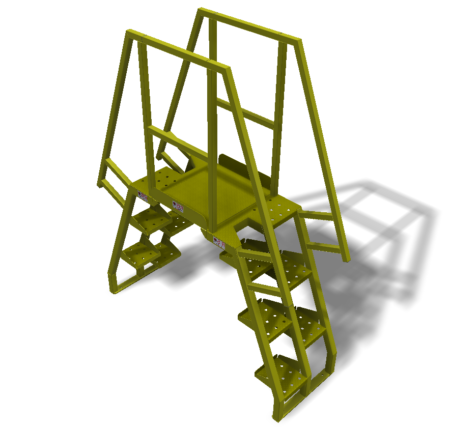 Like all other components of Brazos Manufacturing, the alternating tread stairs are OSHA compliant. Safety yellow completes the professional look to this well thought out application solution. Allow Brazos’ customer service team to work with your application and show you the possibilities. Use our handy contact form to start the conversation. Many times an obstruction like a conveyor line or gang of pipes or cables will force personnel to make long detours crossing the plant or warehouse. All Brazos alternating tread products are custom designed so a quick trip thru our CAD program will yield the best use of space and the safest transit for your individual application. Why build it “standard” when custom is just as fast and just as cost effective. Watch the video below as we run thru some of the configurations that will instantly show us how different configurations will look and mesh with other physical thing in your environment.